T Racking just ship one container of square tube to Australia. As a leading racking & shelving supplier in China, T Racking export a lot of pallet racking & longspan shelving to all over the world. Australia is a major market for us. 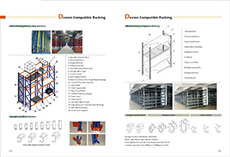 We not only ship finished pallet racking & longspan shelving and rut shelving to Australia, but also ship row material like steel tube, step beam tube to Australia. Our steel tube sell well in Brisbane, Sydney and Perth. Australia local manufacturer can get quality tube product with competitive cost to save their cost. By use steel tube & step beam tube or row post from T Racking, customer can save a lot cost but when keep product quality and make quick delivery to end customer. The Australian customer get our information from exhibition, this customer is a big Australian manufacturer of gondola shelving, retail shelving and shop fixture. They need about 300 ton of tubes every year. Customer send detail RFQ with drawing to us by email. After got their email, our sales staff reply them very quickly. Customer is happy with the cost and other condition. But customer have some doubt for our quality as this is the first time for them to purchase row material from China. As the thickness of material is different from local market, T Racking don’t keep stock for the required size. The Australian customer mentioned they would like to see sample before place order. This is a general process of oversea business. T Racking then order the special thickness from material and tool required tube to customer. Although this increase the cost as it’s difficult to use the material in local market. T Racking do it no doubt just of offer good service to customer. After customer see the actual sample, they are happy with the quality and place trial order immediately. Now the customer order about 3-4 containers of square tube for gondola shelving post from T Racking each month, with the help of our quality product, customer reduce their purchase cost and make them more competitive in Australia market. Attached shipment picture of steel tube.